FarCry 3 pops up on Swedish game stores. Art cover revealed. There were rumours few months back regarding FarCry 3 being developed and it seems they are true as two Swedish game stores, Webhallen and Game have listed the game for sale with pricing and art cover shown below. Other than this incident, a screen writer had also confirmed that he had seen the game when he said that the game had “very impressive materials”. 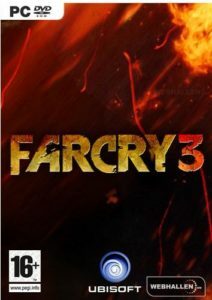 It seems evident now that FarCry 3 is near its final stage of development and MIGHT get released sometime in 2011. The original FarCry was a noteworthy game for its unique environment and gameplay however FarCry 2 was a big dissappointed mainly due to the time it took to get to objectives and the hurdles along the way which made the game very repetitive. It will be interesting to see wether FarCry 3 builds upon the core elements that made it a great game or it is still plagued by the same issues as Far Cry 2. Speaking of issues, according to Amazon the game will have Ubisoft’s dreaded DRM which gave gamers many problems even for the legit gamers. The need for an online connection to play the game can be a major issue with this title unless Ubisoft releases a patch sometime later on after launch to allow offline play.